Today, Artemis manages to nudge a tiny gap open in the kickboard of my fitted kitchen. 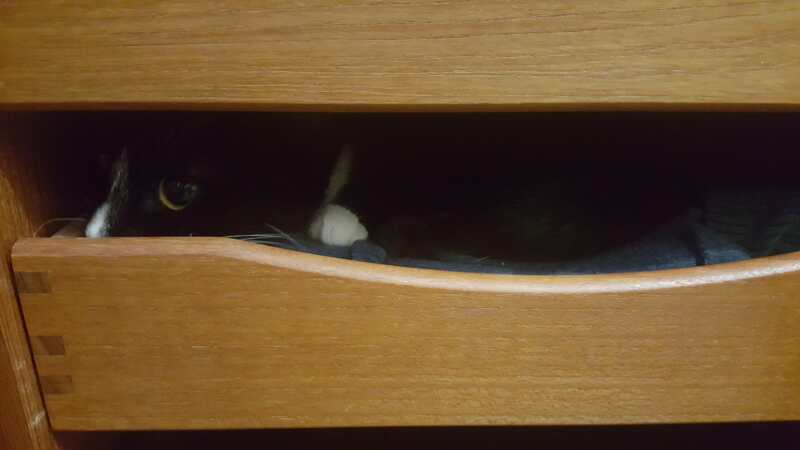 She then flowed through the resulting tiny gap before getting completely stuck, I wondered where she was then found myself hearing despairing mews from behind the backs of cupboards. Once I realized where she had gotten to I removed paneling to let her out but of course her sister then had to investigate the exciting new territory, her hugely fluffy long haired sister. 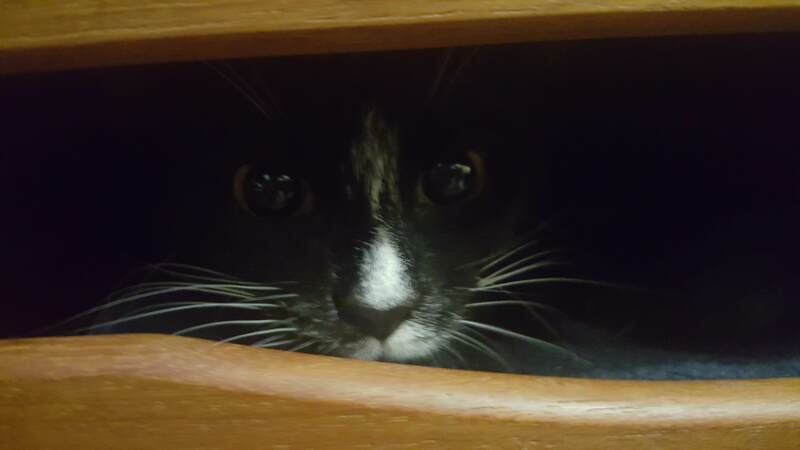 By the time I had both of them lured out I found myself with a pair of extremely dusty and excited 8 month old kittens romping around. Edit: She did it again today, it turns out it was not the kickboard, she was climbing atop the fridge then falling down behind it. I had to unscrew a ventilation grill to let her out after I heard piteous cries then saw her nose through it. I have covered the top with cardboard but will need to work out a less airflow blocking solution. @aria As requested, with much wiggling and squirming..with added bacon to bribe to stay still long enough. @jinshei Awwwww. She looks so earnestly concerned with two eyebrows. Like, I expect her to sit me down for a cup of coffee and have a long talk with me about an important life choice. 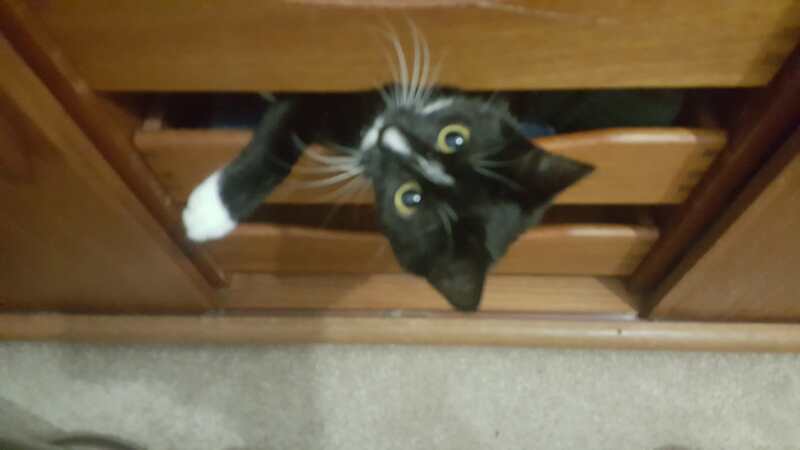 Artemis and the Sock Drawer. @jinshei I survive! Despite the presence of voracious predators in my home. Witness the terror unleashed by floofy Hera as she hunts her preferred prey. @packrat your courage astounds! Also, d'awwwww. My Harley has eaten the anti teeth grinding mouth guard...at least I believe she did since it is gone with no trace. I haven't found the remains yet, but she has taken to burying her preferred items. I just heard my dog and my boyfriend having a 'barking contest' downstairs. @arkandel The boyfriend did. He let the dog outside, so the dog dropped out of the competition. 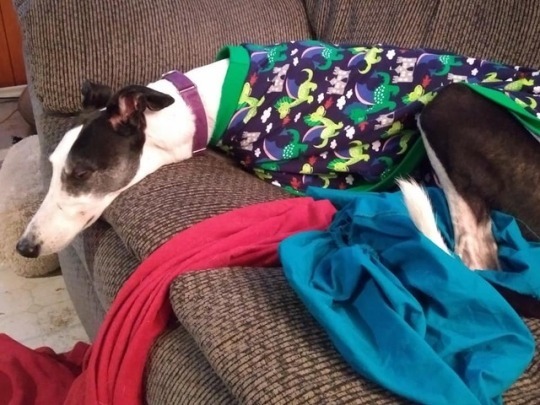 Rock got new sleepwear. Yes, those are dragons. So, A while ago I posted Artemis perching atop a door and having HUGE EYES, she continues to love to jump atop doors and be Very Tall. But sometimes she forgets that she can just jump down and behaves in a hilarious but adorable manner. Enjoy! Also featured: Me sounding Very British. Harley has grown up, and this is her best crazy grin. 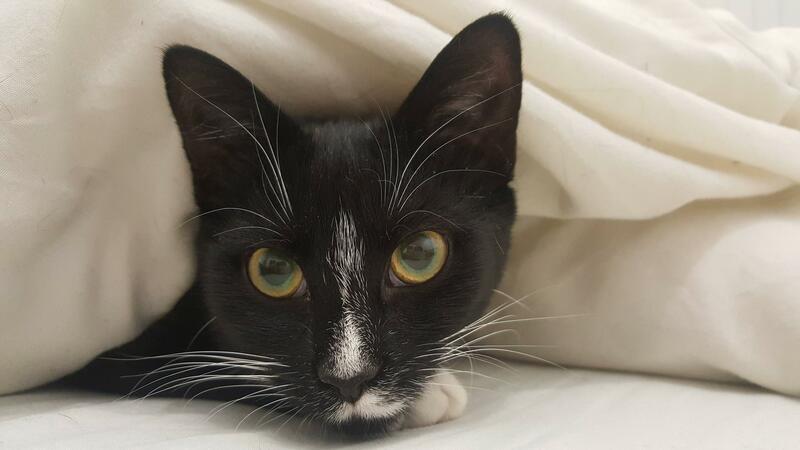 I went to change my bedding earlier only to have a little head pop out from under the duvet. I decided to change the bedding tomorrow instead of disturbing her further but did take this picture. OMG I WANT TO CUDDLE BUNNIES!! !